❤【 Natural & High Quality Wood】Wood slices are made of natural pine wood with barks.Each slice was selected, sanded and polished, safe enough for use. ❤【Suitable Size】The diameter of natural wood slices is about 2.75″-3.15″/7cm-8cm. The thickness is 0.3″/0.8cm. This wood slices has the suitable size for your rational use. ❤【Magical Wood Slices】Wood slices will open your talent of DIY.You and your family can create a magical world.You can use in Christmas decorations, DIY painting ,Gift，coasters, props, wedding decorations, holiday decorations. 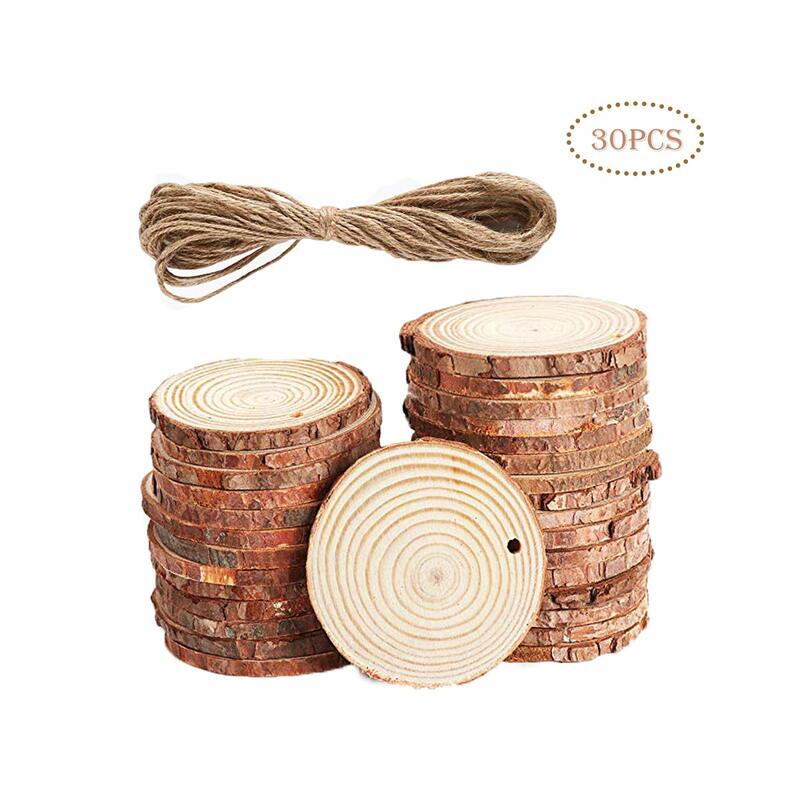 ❤【Pre-drilled Wood Slices】Wood Slices comes with the jute twine.The Length of rope is 33FT/10m .If you order the 50pcs one, it will comes with 2 rolls of 33FT/10m rope.Every slice was drilled with small hole.You can easy to decorate. ❤【Safe and Secure to use】 Pure natural wood through cut, polished and perforated ,finally become the products we sell here. Naturally non-toxic,We have the quality guarantee.Please note: It is normal if some wood bark fall partially from the slices.